IBM WebSphere® Message Broker is a lightweight, advanced enterprise service bus (ESB) that provides a broad range of integration capabilities that enable companies to rapidly integrate internal applications and connect to partner applications. Messages from business applications can be transformed, augmented and routed to other business applications. The types and complexity of the integration required will vary by company, application types, and a number of other factors. Processing logic in WebSphere Message Broker is implemented using message flows. Through message flows, messages from business applications can be transformed, augmented, and routed to other business applications. Message flows are created by connecting nodes together. A wide selection of built-in nodes are provided with WebSphere Message Broker. These nodes perform tasks that are associated with message routing, transformation, and enrichment. Message flows are created and tested using the Message Broker Toolkit, a sophisticated, easy-to-use programming tool that provides a full range of programming aids. This IBM® Redbooks® publication focuses on two specific integration requirements that apply to many midmarket companies. The first is the ability to use WebSphere Message Broker to integrate Microsoft.NET applications into a broader connectivity solution. 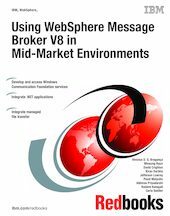 WebSphere Message Broker V8 introduces the ability to integrate with existing Microsoft .NET Framework applications. A .NET assembly can be called from within a message flow and the WebSphere Message Broker runtime can host and run .NET code. Solutions explored in this book cover connectivity to applications using Windows Communications Framework (WCF), Microsoft Message Queuing, Microsoft Dynamics CRM, and other Microsoft applications. The second is the ability to integrate WebSphere Message Broker with file transfer networks, specifically with WebSphere MQ File Transfer Edition and IBM Sterling Connect Direct.